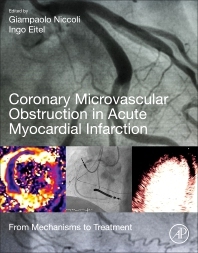 Coronary Microvascular Obstruction in Acute Myocardial Infarction: From Mechanisms to Treatment provides a comprehensive understanding of the phenomenon of coronary microvascular obstruction (CMVO) that is the main limitation of reperfusion therapies in ST-elevation myocardial infarction. It provides in-depth coverage of the phenomenon of CMVO which heavily affects prognosis by increasing the risk of death and heart failure at follow-up. A first of its kind reference dedicated solely to this topic, it is appropriate for a wide audience, from researchers, to those who aid in the management, prevention and treatment of CMVO. 16. Why did all trials on reperfusion injury treatment fail in humans? He is a fellow of the European Society of Cardiology (ESC) and member of several working groups of the ESC. He has acted as faculty in national and international meetings (SIC, GISE, ESC, Japanese Circulation society, Euro-PCR, CRT and TCT). He has been the presenter of more than 200 oral abstracts and/or posters in national and international meetings and is the co-author of 258 publications. He is the recipient of the “Best manuscript published in international journals during year 2006”: SIC Meeting, Rome 2006; the “Young investigator award”: ESC, Vienna 2007; the “Young Leadership Recognition Program”: Washington DC, 2011; and the “Bubble and squeak of the best graded abstracts”: EuroPCR, Parigi 2010. Ingo Eitel studied medicine at the University of Würzburg and trained interventional cardiology at the University Heart Center in Leipzig, Germany and cardiac magnetic resonance imaging at the Stephenson CMR centre Stephenson CMR Centre at the Libin Cardiovascular Institute of Alberta, Department of Cardiac Sciences, University Calgary, Canada. He obtained the board certification in internal medicine, cardiology, intensive care medicine and cardiac magnetic magnetic resonance imaging and currently works as director and Professor of Cardiology at the University Heart Center in Lübeck. The main research areas of Professor Eitel include acute coronary syndrome, reperfusion injury, cardioprotection, cardiogenic shock, interventional cardiology, CMR and Takotsubo cardiomyopathy. He is currently the chair of the working group cardiac magnetic resonance imaging of the German society of cardiology and also member of several working groups of the European Society of Cardiology (ESC). Dr. Eitel has acted as faculty in national and international meetings and presented of more than 100 oral abstracts and/or posters in national and international meetings. He has published over 200 publications and has won several research awards including the Andreas Grüntzig award for interventional cardiology of the German Society of Cardiology. Fantastic overview of the causes, diagnosis and consequences of coronary microvascular obstruction. Many thanks to the Editors and authors for putting together such an excellent book. Congratulation!